In the grand scheme of things, there are a lot of crappy things about being a grown up. January bills. Dirty laundry. Car trouble. Memos. Doubt. Today those symptoms of adulthood were particularly pernicious for me, so I drew on the best weapon I had to fight them: pancakes for dinner. Pancakes have long been a source of comfort for me. As a kid, we’d have pancakes when Dad made dinner. That was a special occasion in the Hutchison household. Perhaps this is why in my first apartment kitchen, I’d always keep a box of Bisquick pancake mix at the ready. Its very presence was a comfort since it meant I could come home after a rough day, shrug off my regular dinner plans, and opt instead for tender pancakes with a maple syrup chaser. These days I like more sophisticated (and ethical) ingredients than Bisquick and water for my pancakes, so I’m always on the lookout for healthy, from-scratch options that deliver the same endorphin kick as my old standby. This Cinnamon Apple Pancake Cake is the best thing I’ve found yet. It’s soft and sweet like regular pancakes, but it is lower maintenance since it bakes in the oven like a traditional cake. In a tiny concession to adult responsibility I include in my version of the recipe two whole apples and some whole wheat flour. 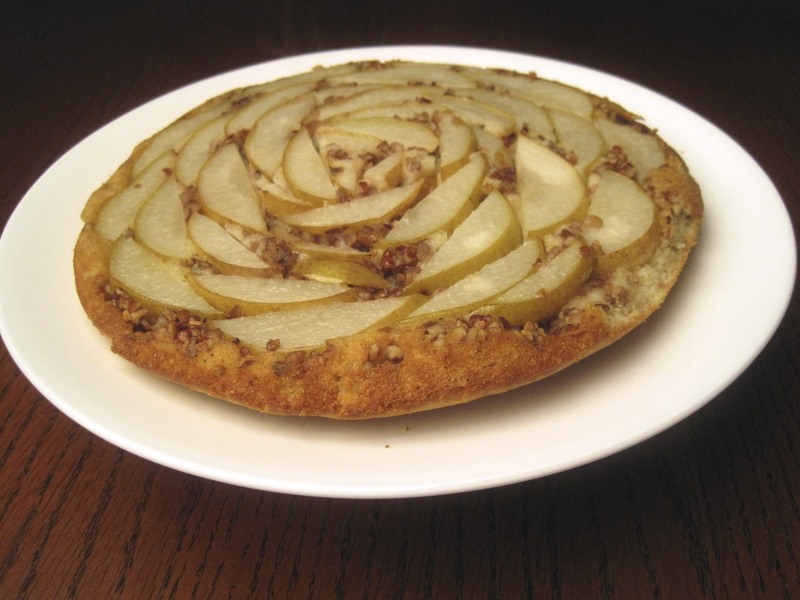 My favorite part is that the apple slices on top of the cake make it look like a flower. Awww. I found the original version of this recipe on Allrecipes.com, submitted by user Marbalet. I stayed true to the spirit of her dish in my adaptation, but there are some important changes. Instead of pre-boxed pancake mix I use my own proportions of Richardson Farms whole wheat flour, all-purpose flour, baking soda and baking powder. I also increased the moisture in the cake by using buttermilk instead of regular milk, and I cut back a bit on the butter. I hope that if this recipe finds you in need of a little comfort, you’ll have everything on hand to make it for yourself. Preheat oven to 350 degrees. Combine all-purpose and whole-wheat flours, plus baking powder, baking soda, and cinnamon in a mixing bowl. Stir in buttermilk and egg. Set batter aside. Core apples and cut in 1/4 inch slices. Put butter in a glass pie plate and microwave for 30 seconds, until it’s melted. Swirl so that butter coats the bottom of the plate. Next, arrange apple slices on the bottom of the pie plate. Sprinkle apple slices with brown sugar and pecans, then pour in the batter. Bake cake in preheated oven for 30 minutes, until it is light brown and springy. A toothpick inserted in the center should come out mostly clean. Run a paring knife along the edges of the pie plate to loosen the edges of the cake, and then invert it onto serving dish. 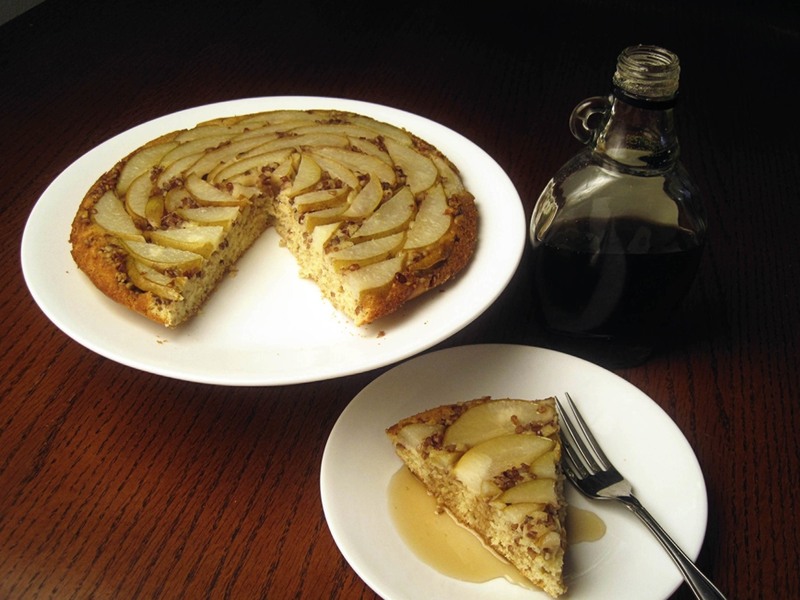 Cut cake into wedges and serve with maple syrup. * Make buttermilk out of regular milk by adding a 1/2 tablespoon of white vinegar to 1/2 cup milk and letting it stand on the counter for 5 minutes. This sounds soo delicious. I can’t wait for this weekend to try it! I’m right there with you on the bisquick. Our standby was Chunky Beef Soup with Biscuit topping. I still make it when I am really cold and wanting an easy comfort meal. Looks lovely! I’m a big fan of breakfast for dinner as well- I agree that it’s comforting. Hope the yummy meal eased your troubles. My husband does BFD for our girls often; they love it. I was heartbroken when I found out what Bisquick actually has inside! Ugh. This pancake is so chic, great for a brunch and I can’t wait to try it. I wish you got a shiny trophy saying “Awarded for Adulthood” every time you did something grown-up, like banking. Amy, thank you! Dads = pancakes. Yes. Simone, I hope you enjoy it this weekend. Andrea, seconded. We all need more trophies. Christi, the lard was what put me over the edge with Bisquick. yum this looks amazing! Perfect for a weekend brunch–can’t wait to try it out! First off, this is delicious! When I made it the first time, I found the batter to be a little too thick and sticky to easily cover the whole pie pan. Today made it with a full cup of buttermilk and it was perfect. May also try with 2 eggs next time and only 1/2 cup to see if that makes a difference. Big hit in our home though!